MILFORD, Mass. – It was not a banner day for the Hawks at the plate. Heading into the bottom of the sixth inning, Milford had only three hits of Hopkinton pitcher Bri Mirabile and none of them had traveled more than 10 feet from home plate. With the home team finding itself down by a run with just six outs remaining, the Hawks needed a response. 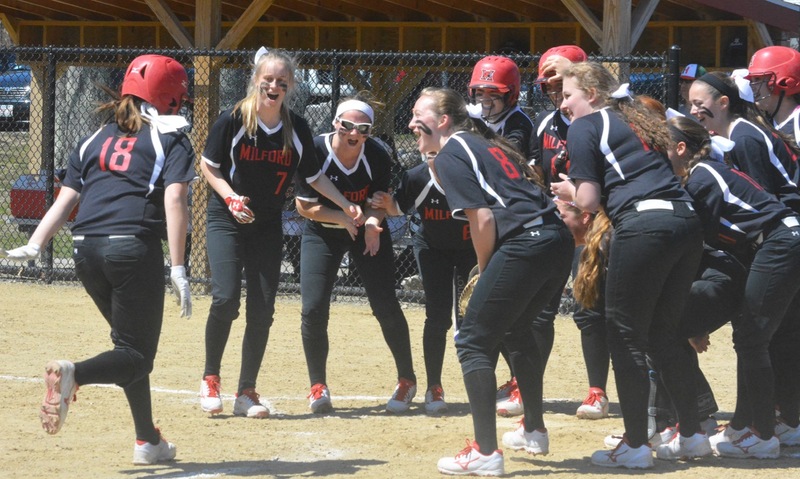 Jess Tomaso, a sophomore transfer from Hopedale, has proven to be a clutch hitter for Milford during its opening four games of the season and she came through again on Thursday afternoon with the big hit that the Hawks needed. Tomaso lined a two-run homer to left to provide Milford with the go-ahead runs in the sixth inning and the Hawks threw out the tying run at the plate in the seventh to walk away with a 3-2 victory over Hopkinton and stay unbeaten through the first five games. Hopkinton took the lead in the top of the sixth against sophomore pitcher Kelley Reichert, who had limited the Hillers to just one hit and two base runners through the first five innings. Kate Welzel drove a one-out double to right center that plated a pair of runs and made it 2-1. Reichert managed to get the next hitter to line to Kate Irwin in left for the second out, but then gave up a single to her opposite number, Mirabile. Sydney Pounds throw to the plate was blocked by catcher Megan Jacques, forcing Welzel to hold at third. A grounder to second ended the inning for Reichert, who finished with four strikeouts in six innings and showed that Milford has depth in the circle behind junior Ali Atherton. Mirabile had only allowed two infield singles and a bunt single through the first five innings, as Milford struggled to make significant contact, but Maggie Farrell started the sixth by lining a shot nearly to the fence in center that the Hopkinton player tracked but could not haul in. The error proved costly. The next hitter was Tomaso, who had walked and flied out to right. She got hold of a 2-0 pitch and drove it well past the fence in left to instantly put Milford back on top, 3-2. “It’s definitely not the best game we played this year but tip your cap to their pitcher, Mirabile, she kept us off-balance all day, threw strikes, and I just don’t think it was our best day with the sticks,” said DiVitto. Atherton came in to close the game out in the seventh, but got a little help from her defense to shut the door. Katey Holly, the No. 7 hitter, led-off with a single to center and, after a strikeout, was advanced to second on a sacrifice bunt. Lead-off hitter Emily Whelan lined a two-out single to left and Hopkinton coach Kiely Murray elected to send the runner. Irwin scooped the ball cleanly and hit third baseman Kaitlyn DeCapua who then relayed the ball to Jacques at home. Jacques blocked the plate, applied the tag, and Milford had the victory. Milford’s only other run came in the third inning. With two outs, following Mirabile’s fourth straight strikeout, Irwin bunted down the third base line. She would have been safe at first anyway, but the throw was wild and she advanced to second. Emily Piergustavo drew a walk and then drew a throw from the catcher, which sailed into right field. The rightfielder’s throw back to the infield was errant allowing Irwin to score an unearned run for the Hawks. Milford (5-0) will look for its third non-league win of the week when it travels to take on Silver Lake (widely considered the No. 1 team in the state) on Saturday.